CALL 800 430 6536 FOR APPLICATIONS SUPPORT - Reinforced and unreinforced plastics are tensile tested per ASTM D638 which sets the test machine requirements as well as sample geometry and test methods. 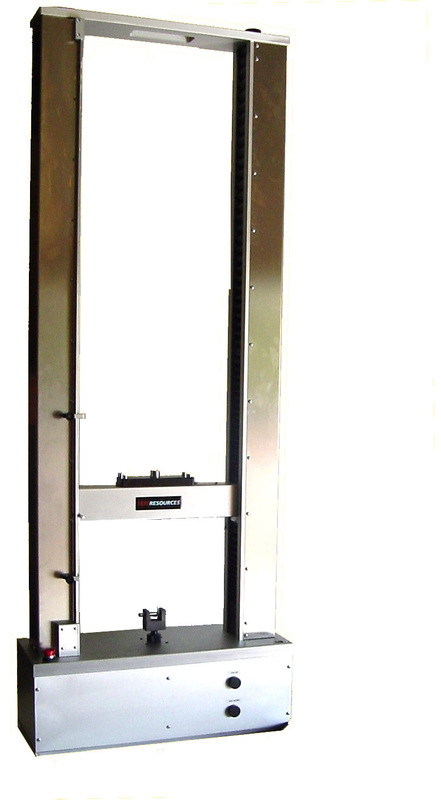 The mechanical tester is configured specially with fixtures and software. 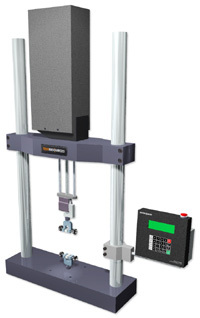 Any TestResources tensile tester may be equipped to perform a constant rate of extension (CRE) pull test or tensile test using one of several choices for wedge grips, vise action grips, or pneumatic grips. Specimens are placed in the grips of the tensile testing machine and pulled to elongation at fracture, or failure. Test speed and grip separation or strain levels are based on material properties. 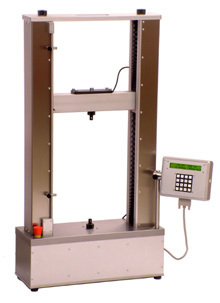 The test requires measuring load and strain, or head travel of the tensile tester machine head. In the case where the sample elongates less than 20% and modulus is desired, a 50 mm gage length extensometer is required. Load and deflection data can be translated into a stress-strain curve, and tensile properties may be extracted. 2000M Robust Dual Column,16" between columns, 28" travel, load cell mounted in upper crosshead – Standalone Controller offers constant speed (CRE type) and constant load control. Applications software available. 2000M48 Robust Dual Column,16" between columns, 48" travel, load cell mounted in upper crosshead – Standalone Controller offers constant speed (CRE type) and constant load control. Applications software available. 2000M5 Robust Dual Column,16" between columns, 28" travel, load cell mounted in upper crosshead – Standalone Controller offers constant speed (CRE type) and constant load control. Applications software available. 100P1000 Expandable Modular Single Col Test System – Manually adj crosshead (31”) with 6” or 12” test stroke – Standalone P controller features constant adjustable test speed with peak load and elongation at break display. Data is exportable to Excel etc. 100P1000DC Expandable Modular Dual Col Test System – Manually adj crosshead (31”) with 10” test stroke – Standalone P controller features constant adjustable test speed with peak load and elongation at break display. Data is exportable to Excel etc. 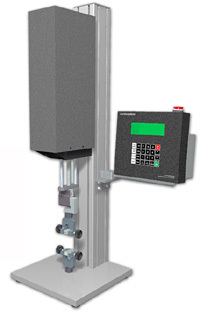 100P500 Expandable Modular Single Col Test System – Manually adj crosshead (31”) with 6” or 12” test stroke – Standalone P controller features constant adjustable test speed with peak load and elongation at break display. Data is exportable to Excel etc. 100P500DC Expandable Modular Dual Col Test System – Manually adj crosshead (31”) with 10” test stroke – Standalone P controller features constant adjustable test speed with peak load and elongation at break display. Data is exportable to Excel etc. 100P250 Expandable Modular Single Col Test System – Manually adj crosshead (31”) with 6” or 12” test stroke – Standalone P controller features constant adjustable test speed with peak load and elongation at break display. Data is exportable to Excel etc. 100P250DC Expandable Modular Dual Col Test System – Manually adj crosshead (31”) with 10” test stroke – Standalone P controller features constant adjustable test speed with peak load and elongation at break display. Data is exportable to Excel etc.